The ECB maintained its monetary policy unchanged as expected, no news on future rate hikes. US inflation retreated in August from a 10-year peak, remained above the Fed's target. Worse-than-expected US inflation and the ECB´s monetary policy meeting outcome sent the EUR/USD pair up to 1.1700, its highest for this September. US inflation resulted below the market's forecast, with core annual inflation easing to 2.2% after reaching a 10-year high of 2.4% in July, cooling down modestly chances of four rate hikes this year, although with chances of a September hike unchanged at 95%. Monthly core inflation increased by 0.2% matching the previous reading and missing market's expectations of 0.3%. As for the ECB, the central bank left rates unchanged as largely anticipated. In his speech, President Draghi highlighted the risk related to protectionism and said that the monetary policy will remain accommodative, even after assets purchases stop. When asked about the matter, he said that a first rate hike wasn't discussed. The central bank downgraded growth forecasts for this year and the next ones but maintained the inflation forecasts unchanged. The dollar came under pressure against most major rivals, although the decline stalled after US President Trump stated that there's no pressure to make a trade deal with China. The macroeconomic week will end with US August Retail Sales to be out this Friday, foreseen posting another month of solid growth. 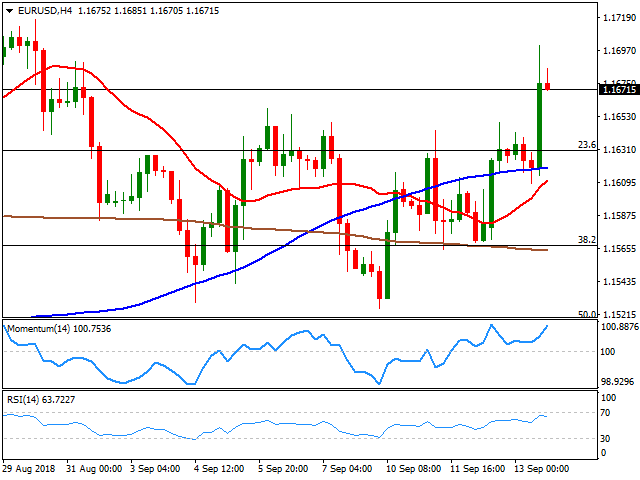 The EUR/USD pair stabilized in the American afternoon above the 1.1660 level, a strong static support now, followed by 1.1630, the 23.6% retracement of the August rally. The break above this last leans the scale to the upside, with scope to surge up to 1.1733, August high. Technical readings in the 4 hours chart favor such advance, as the pair met buyers on an approach to its 100 SMA, now developing above all of its moving averages and with the shortest advancing. The Momentum indicator maintains its bullish slope and nears weekly highs, while the RSI consolidates around 64, also favoring additional gains as long as the mentioned Fibonacci support holds.